L’ARIETE is located in the heart of Italy and can be conveniently reached no matter whether you tour Italy with your car or fly in. The nearest airport is Perugia (Ryanair, Stansted) | 45 mins. Airports at Bologna, Florence, Ancona & Rome (all major international airlines) | 2 hours. Pisa (Ryanair) 3 hours. Car rental is possible and easy on all airports. Here you find the Google maps view of L’ARIETE. 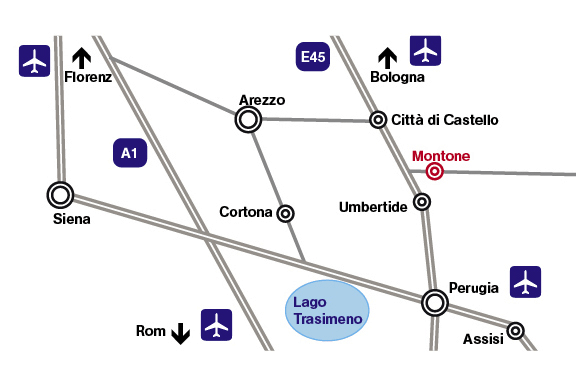 Montone is easily accessible via the E45 connecting Bologna with Roma, or the A1 connecting Florence with Rome. Drive up the hill towards Montone on a white gravel road for 300m; no worry, the signs of L’ARIETE will guide you! We will send you detailed directions as part of your booking information package.